The song has been recorded by many artists including Josh Groban. It was nominated for Gospel Music Awards four times and Grammy Award. The course comes with five video lessons (48 minutes)with a virtual keyboard demo and a lead sheet. 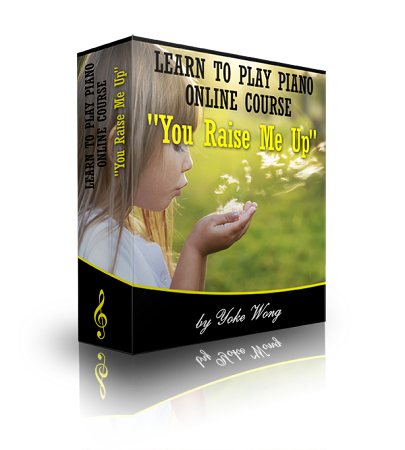 The step-by-step instructions show you how to play You Raise Me Up in a fast and easy way. It is suitable for intermediate and advanced players and those who would like to dress up piano music with different chords. The video download lessons are very useful ! The video download lessons are very useful ! Easy to follow ! with special left and right hand tips to keep you focused on improving your playing skills ! More modern pop music please ! This song lends itself well to practicing playing in the keys of D, E and F. Ms. Wong explains the basics and points out the add-on embellishments. One could also kind of "read between the lines" by simply watching her fingers dance over the piano keys in a sensible, logical and beautiful way. Highly recommended.